Students for a Democratic Society (SDS) has decided to engage in a new national campaign, demanding education for all! A place where students of all genders, races, sexual and romantic orientations, etc. are supposed to attend for higher education, the U.S. University system grows ever more exclusionary via individual university policies and policies made by the state, which enable them. These academic institutions would not exist if it weren’t for students, yet they continuously fail to meet the needs of the population they were created to serve. This is why we are demanding education for all; it’s time for schools to listen to the students’ voices and work in our interest. Public universities all over the country engage in restructuring and molding university policy in order to sustain profit growth. This manifests in tuition hikes and budget cuts. And the money and resources students lose to these policies go into the pockets of rich administrators that supposedly work in the student body’s interests. Many schools also practice legacy - affirmative action for the rich alumni - or base admissions on racist testing, while they continuously reexamine whether affirmative action should be enabled for African American students, whose enrollment has dropped over the years. We believe education is a right, not a privilege, and this right extends to everyone. This is why SDS has decided to embark on this new campaign, local in practice and national in scope. We demand that tuition is free for all students. We will not be victims of the privatization of our schools, forcing us into years of crippling debt that we cannot pay off. We demand that our schools practice increased enrollment and retention of non-white students. We will not allow students of color to be barred from colleges and universities. We demand that our schools provide equal access to undocumented students. Undocumented people should be afforded the same ability as documented people to access higher education. It is in light of the aforementioned conditions that Students for a Democratic Society has taken up the Education For All campaign nationally. On several campuses we have already forced administrations to meet our demands, or are currently struggling to do so. 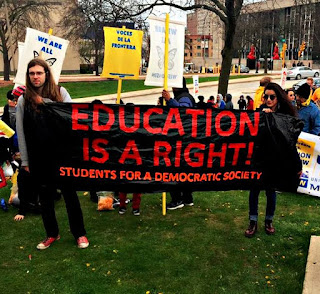 SDS chapters in Florida won a vital victory in their statewide struggle for tuition equity. FSU Students for a Democratic Society is now fighting to maintain affirmative action on their campus. SDS chapters in North Carolina are currently fighting to repeal the transphobic HB2 that was passed, upholding the struggle for gender neutral bathrooms. 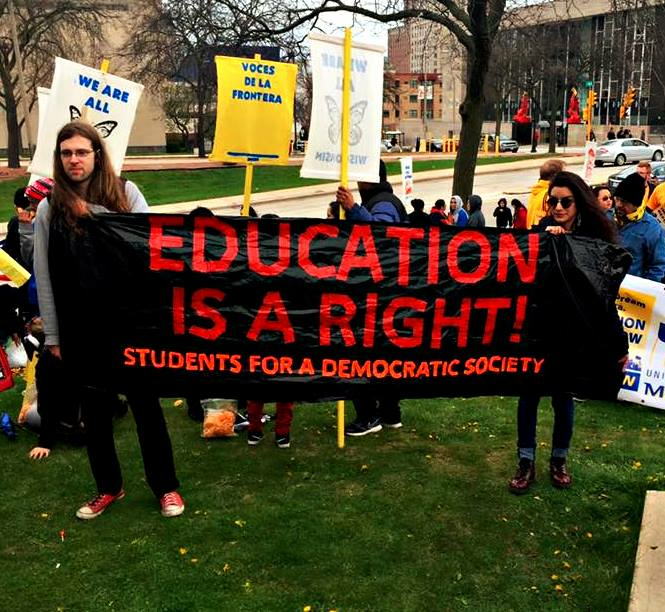 Milwaukee SDS’ current campaign is to “Chop From the Top” which would redirect budget cuts from important educational resources to their administrators’ pay checks. SDS in Salt Lake City, Utah, is struggling to gain tuition equity for undocumented students. Amongst many other efforts. National SDS invites other organizations to join us, as we march forward to ensure a University system that supports the students, and not the other way around; for a University system that is dedicated to education for all!